rebecca likes nails: another gradient zebra! 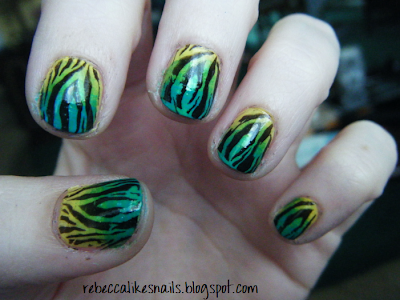 Well seeing as everyone loved the gradient zebra nails from the other day, I have another set to show you! This was the first gradient I ever tried, and I wasn't great at stamping at the time, so I missed the tips of a few nails, hahaha. Not too bad for a first try! Now that I have a new camera, I should redo this combo and get nicer pictures. and congrats on the exams! Who has exams on saturday?? wft?? beautiful beautiful ! so jealous . i think i might try this !